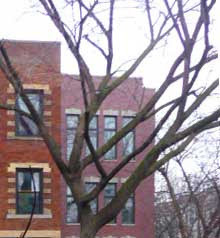 Chicago plants thousands of trees a year, but few in East Village. The April 5 meeting of the East Village Association will dig deeper into the reasons for that, and explore how to make the neighborhood a greener place. Guests in this run-up to Arbor Day will include Mark Duntemann, whose Chicago company Natural Path is a consultant on urban forestry management. The meeting starts at 7 p.m. in the Happy Village, 1059 N. Wolcott. Bringing more trees to East Village is one of EVA's goals for the year, and an agenda item leaders plan to press on the new 1st Ward alderman. As the original sponsor of the Frankie Machine Garden at Wood and Haddon, EVA has a long track record on urban greening. This year EVA is trying to revive a stalled 1990s city plan to beautify Augusta Boulevard, which lacks much of the landscaping associated with the city's boulevard system. The project would have constructed sidewalk bumpouts as bookends to street parking. Since then city agencies have expanded their own forestry work in the Chicago Tree Intiative. The Chicago Park District and the Streets & Sanitation department each plant thousands of trees annually. That effort goes beyond beautification: A city climate action plan aims to lower energy costs in part by shading sidewalks from summer heat.